This even is free and open to the public. Refreshments will be served. Be sure to look out for the interview with Lydia Davis in the upcoming issue of Italics Mine, coming out in December. 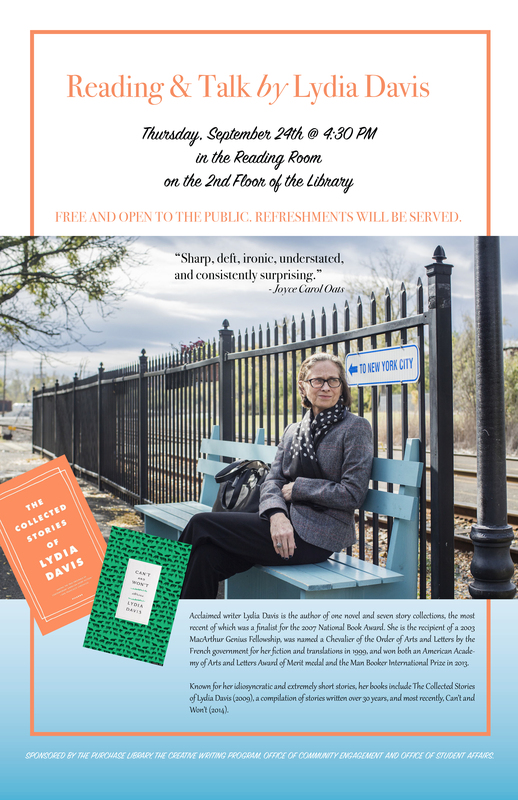 Acclaimed writer Lydia Davis is the author of one novel and seven story collections. Her collection Varieties of Disturbance was a finalist for the 2007 National Book Award. She is the recipient of a 2003 MacArthur Genius Fellowship, was named a Chevalier of the Order of Arts and Letters by the French government for her fiction and translations in 1999, and won both an American Academy of Arts and Letters Award of Merit medal and the Man Booker International Prize in 2013. Known for her idiosyncratic and extremely short stories, her books include The Collected Stories of Lydia Davis (2009), a compilation of stories written over 30 years, and most recently, Can’t and Won’t (2014). Reblogged this on The Hepkat.